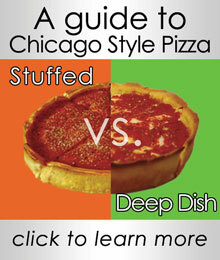 Welcome to A Slice of Chicago - Ship Chicago's Pizza Nationwide! Only orders shipping to MN, IA, MO, AR, WI, IL, MI, IN, KY, TN, OH, NY, PA, NJ, DE, MD and CT are eligible for "shipping included" pricing. Discounted UPS overnight and 2 day shipping rates are available at checkout for all other states. Two 10" Deep Dish Pizza All-Stars, 5-6 servings. Two 10" Stuffed Pizza All-Stars, 5-6 servings. Two 12" Deep Dish All-Stars, 8-10 servings. Copyright A Slice of Chicago. All Rights Reserved. eCommerce Software by 3dcart. Copyright 2012 Chicago's Pizza Inc.